September 14, 2014 World Bulletin/News Desk The chairman of the International Union of Muslim Scholars has spoken out against the U.S.-led coalition of nearly 40 countries against the ISIL. 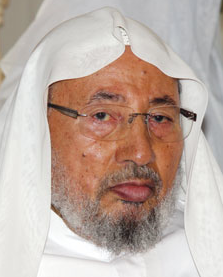 Academic Yusuf al-Qaradawi commented: ‘I have completely different ideas and methods from IS. On the other hand, I do not accept the United States action to fight against them because the US follows its own interests, not Islamic values.’ The comments were written in Arabic on Sunday on al-Qaradawi’s Twitter account. A group of nations, including 10 Arab states, have agreed to form a coalition to tackle IS in Iraq and Syria. For a profile of the International Union of Muslim Scholars (IUMS), go here.